Tradewind Accent Telephone Table This neat little accent table is a great size to tuck in between a pair of chairs. On clearance now at Bed, Bath, & Beyond for $39.99. 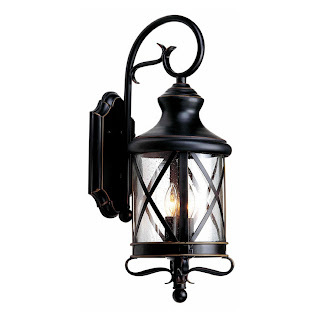 The Portfolio 2-Light Bronze Outdoor Fixture from Lowe's is just the right size for the front of the garage or to flank the front door if you have a large scale entryway (the scale of the fixture would be too large for an average-sized front door). Priced right at $34.96, this fixture has been selling out at my local Lowe's. An even larger 3-light version is also available. 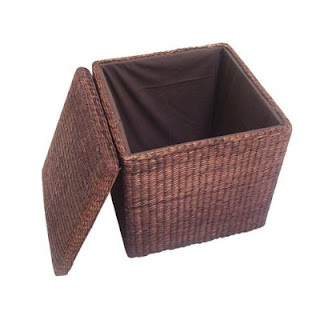 The Seville Rush Cube Storage Ottoman offers attractive, practical storage. Strong enough to serve as an extra seat in your family room, this versatile piece is only $39.99 (available through Target's website). The Studio Swing-Arm Table Lamp from JC Penney features simple, classic lines and provides task lighting just where you need it for $39.99.